Imagine as you're nodding off to sleep one night, you realise there is a big furry creature with long ears outside your bedroom window staring at you. Why didn't you purchase curtains? This is pretty much the premise of Buddy & Me: Dream Edition. 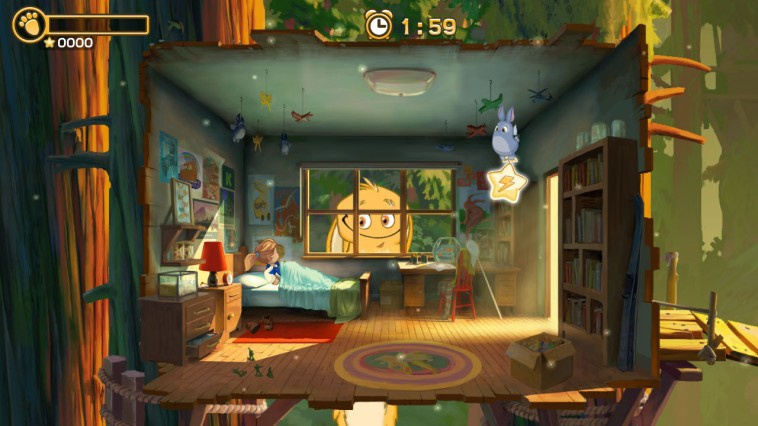 The "Dream Edition" part of the title is derived from the fact this family-friendly endless runner by Seattle-based indie studio, Sunbreak Games, has been ported across from mobile platforms to the Wii U with additional content and enhanced visuals. 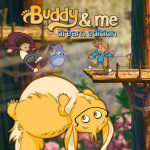 According to the game's developer, Buddy & Me combines feelings of nostalgia, childhood exploration and companionship to create a unique endless runner experience. The giant flying creature, Buddy, is essentially a child's imaginary friend who is always watching out for them; Buddy takes the child that dreams of the same enchanted forest every night on an adventure. 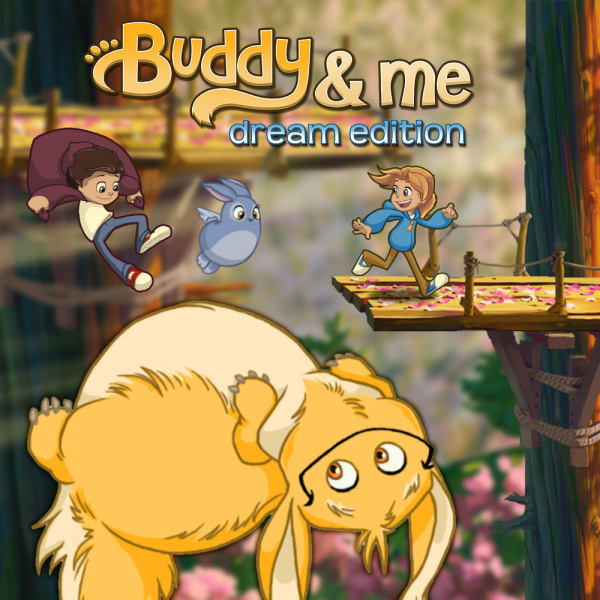 Being an endless runner, Buddy & Me is a pick-up-and-play game experience, making it accessible to all ages. 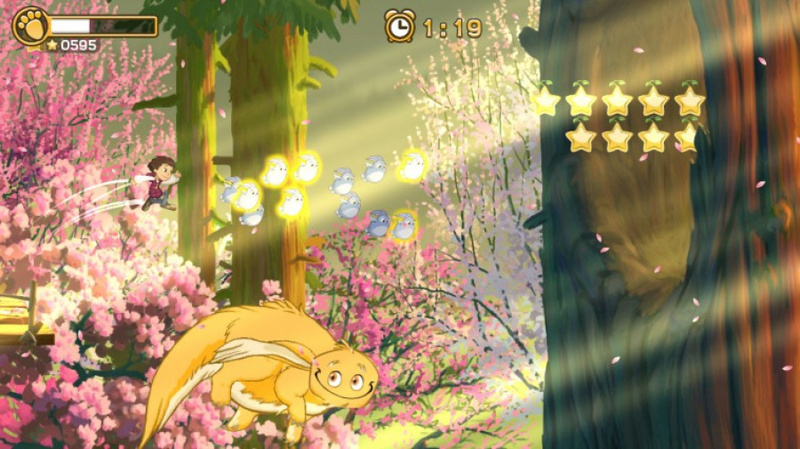 Taking control of a young boy or girl, the player must navigate the dreamer through one of the four seasonal levels collecting stars and ultimately seeing how far they can travel. The controls include a jump button, a double jump and also the ability to glide. These moves will all be used as the player runs along platforms making huge leaps. 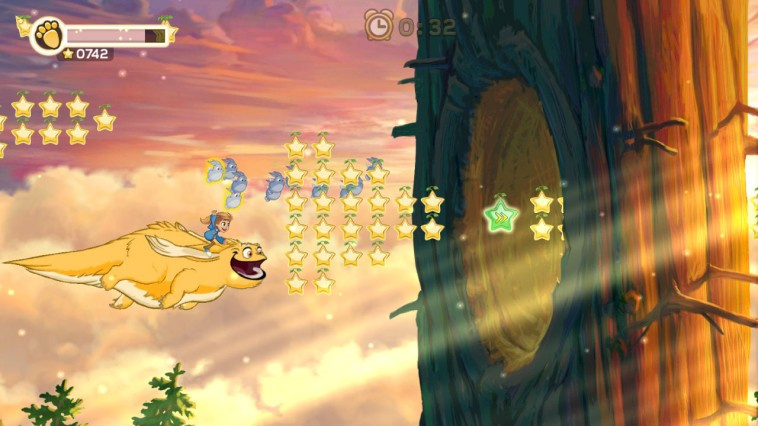 Additionally, Buddy will come to the child's aid from time to time to assist them; this is when the player takes control of Buddy as the friendly creature flies through the clouds. There are also smaller creatures to collect that represent additional lives. Stars collected in each level unlock extra levels, upgrades and also concept artwork - it's a clear cut reward system; those levels, as previously noted, are based on the four seasons of a year. The upgrades add time to the clock or extra speed to the runner, while there's also a power-up to help the child gather more stars. Disappointingly, there just aren't enough of these unlocks on offer, resulting in little incentive to continue gathering stars for very long. However, speaking of stars, the artwork in Buddy & Me shines brightly. Sunbreak Games has drawn inspiration from animated films such as My Neighbor Totoro to create some stunning backdrops and character design. There are also plenty of finer details in each level such as rays of sunlight shining through trees and petals falling from above, adding to the overall beauty. Unfortunately, the enhanced visuals for the Wii U version of the title become a secondary thought due to the title's frame rate. For an endless runner it's not as smooth an experience as it should be - Buddy & Me sadly does not seem to keep up with its own pace, often stuttering. This makes certain jumps harder to make and creates problems as the speed increases. The game engine reportedly evaluates the player's skill level and then adjusts the difficulty and level accordingly, but often this is hard to appreciate with the frame rate struggles. In addition the music, despite being fitting for the setting, loops relatively quickly and becomes annoying after a while. No Buddy of mine, then! "...but for anyone else out there it's perhaps worth looking around for a superior endless runner." You mean anyone besides Alex Olney? That's too bad. I was really pulling for this to be a solid game. I'll pick it up if it ever gets a large sale. Can't really say I'm surprised. Can't say I'm not a little disappointed, though. I'm really disappointed by this. I was actually really intruiged by the game, enough so that I will probably end up getting it anyway, but this review will keep that from being as soon as I'd planned. Should let Alex review this one, at least he got the word out! @sillygostly Agreed. I got the game and while I don't mind doing a run now and then, the lack of diversity hurts it a lot. I JUST saw this and thought the art look pretty, happy to see a review on it with my timing. Gonna have to pass on it. Maybe that is the case, I have not played Buddy and Me, just seems odd. in short bursts, like Bird Mania.. Endless runners, ladies and gentlemen. And with all the present issues with pokemon go you guys gave that 8/10 ??? I just don't have the money to spare for a game like this. Sadly I'll be giving it a miss. Even worse, the fact it got a pretty meh review. Sounds like a charming premise for a platformer or something. Not a stupid endless runner. What a waste of potential. How can you even compare those two games, it's like night and day? @Pablo17 Different reviewer for each game. But you're right, no way did Splashy Duck deserve a 5. At least Buddy & Me is an original creation, and a good looking one to boot. Ouch, a 5! It still looks pleasing though, I might still try it someday. Title makes me think of that commercial back in the 80s. My Buddy, My Buddy, My Buddy and Me.